Who are the underdogs? What makes them underdogs? Are they weak or is it just another perception of people who cannot understand some things and therefore, love to label them to their convenience? Perhaps the concept of the underdog has been grossly misunderstood. Perhaps it needs to be relooked given how some of them have fought battles and won against giants, with may be limited resources. Is it always the case though? Do underdogs win all the time? Did David win against Goliath by mere chance or did he have some clear advantages, which the giant did not? With this premise in mind, Malcolm Gladwell’s new book, “David and Goliath: Underdogs, Misfits, and the Art of Battling Giants” is all about this principle, presented with facts and approaches it with a range of examples of the number of Davids and their struggle to get ahead. I had read one book written by Gladwell before reading his latest work. I was hesitant – also because I had heard that the book was not that great. However, I took my chance and read it, finished it in a span of a day and a half and thoroughly enjoyed it. The book hooks you on from Page 1 and then there is no letting go. I think to a large extent the book connects with you, because we all feel that we have been or are underdogs at one point or the other. So you not only end up reading the book for what it is, but also silently cheering for the misfit to make it big. The book is divided into three sections – the first one is about how advantages are sometimes disadvantages and vice-versa. Things are never what they seem and one always has to look for different alternatives to rise above. From a novice basketball coach to the number of children in one classroom in the schools of America and across the world to the most interesting theory of “Big Fish in a Small Pond and Small Fish in a Big Pond”, this section is my most favourite in the entire book. The second section is about weaknesses and how desirable they can be given how many people succeeded with them. Handicaps need not always be handicaps. The third and final section of the book is about the limits of power and how it does not always be everything, given any context or situation. “David and Goliath” is not only an insightful read, but also at some level it does become a personal read, right from the first to the last section. You tend to relate to situations and anecdotes and I found myself nodding in affirmation to most of them. The book is a light read. The statistics do not flummox the reader, which is very good, given the nature of the book. 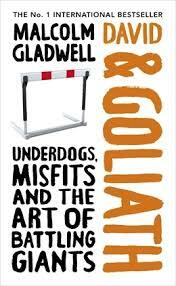 “David & Goliath” is the kind of book that will make you contemplate situations around you and probably reassess them – mostly with respect to the so-called “misfits and underdogs”. This entry was posted in Allen Lane, Books, Non Fiction, Penguin Books, Review and tagged allen lane, David and Goliath, Malcolm Gladwell, Misfits, Non-fiction, penguin books, psychology, Underdogs on November 10, 2013 by thehungryreader. There is always this sort of competition between dog and cat lovers. Who are better creatures? What are their characteristics and how sometimes they grow to define their owners is also very interesting to note. We want to know more about the pets we own and yet somehow we do not have the time to get to know more about them and why they behave the way they do. “Cat Sense: The Feline Enigma Revealed” by John Bradshaw is an insightful book into cats and how they have come to me from ages ago. Cats have always been under-researched. This topic has always intrigued me (though I am a dog-lover throughout) and I have always wanted to know more about these enigmatic creatures and their behaviour. 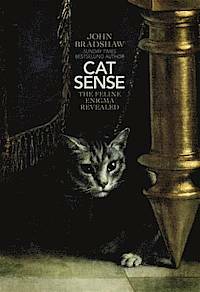 “Cat Sense” is also not surprisingly a BBC series, which must be watched after you finish reading this wondrous book. “Cat Sense” speaks of cats right from the beginning. From the history of domestication of cats, to how their senses are different and what makes them act the way they do, to drawing on the social life of cats – which to me was the most interesting part in the entire book. What John also does is let some mysteries about cats be and not delve too much into them. Bradshaw also tackles his subject as being a certified Anthrozoologist for over thirty years. He writes sharply and draws from his experience with cats which adds that much needed personal touch to the book. The snippets of information and trivia are worth noting more so if you are a cat lover. Bradshaw also touches on the most misconceived notion of cats being selfish creatures and demystifies it for the reader. I have a lot of friends who are cat lovers and I know for one that I would be telling them to read this book, which they will cherish and love as much as I did. This entry was posted in Allen Lane, Books, Non Fiction, Peirene Books, Review and tagged allen lane, Cat Sense, Cats, Enigma, Feline, John Bradshaw, penguin books on October 16, 2013 by thehungryreader. Why do people from one culture think and see things differently from another? Why do they almost feel and also emote differently in some situations? There are so many instances when people from a different race or culture act and think differently and yet while most of us question the differences, there are times when thoughts regarding those do not cross our mind. The differences also stem from the nurture or the nature angle, which there have long gone been debates about in our world. The book that I have finished reading off-late also talks of the way we view our world and how and why do we do what we do. “Beyond Human Nature: How Culture and Experience Shape Our Lives” by Jesse J. Prinz completely left me astounded by the end of the read. It gave me more perspective to the human condition and what impact do places and upbringing and what surrounds us have on our way of thinking and behaviour. Prinz asks if the idea of human nature has any place in the sciences and the book tries to unearth or discover that very thought. The argumentation is strong in most places and somehow felt weak in some others, which I ignored, because the overall book appealed to me. The book is divided into six parts and each part focuses on the idea of where do the following come from: Feelings, Values, Traits, Knowledge, Language, and Thinking. While the book is great overall, the reader cannot start reading the book from any part. The vast diversity of behaviour is explored in great depth in this book with a lot of relevant instances, which both astound and amuse. The conclusions for each argument are valid and rolled out well, also carefully tying the knots. There is no vagueness left for the reader to deal with. There are times when I do not read non-fiction because I cannot make sense of some of it and then there are times when such a book comes along my way that makes me want to read more on these lines and the topic. There is a lot to garner and take away from this book – both individually and from a societal perspective. 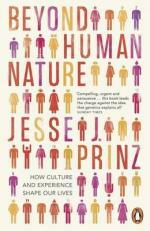 It is amazing how Prinz has woven the concept of nature vs. nurture so brilliantly around the premise of this book. I would recommend this book to those who want to know more about this topic and yet can keep up with the slow pace of this book. This entry was posted in Allen Lane, Books, Non Fiction, Penguin Books, Review and tagged allen lane, Beyond Human Nature, culture, experience, Non-fiction, penguin books on March 24, 2013 by thehungryreader.